Relax, come and enjoy 1400 square feet of living space with ocean views from the two bedrooms, living room, dining room and our second floor balcony. For your enjoyment, the beach is less than 200 steps away. Walk through our private lot. Take a few more steps and your on the boardwalk that travels over the dunes and onto the beach. The wildlife you see along the way may include pelicans, gulls, gopher turtles and dolphins. The sand is firm, the surf glides long distances over it and the water can be perfect for surfing, body surfing or floating. Bring the Bocce. The hard water packed sand and soft dunes provide challenging contrasts for new and experienced players. The adjoining yard is also available for picnicing and grilling. Back at the Oasis, (we have nicknamed the duplex the Island Oasis because New Smyrna Beach is an island and the home provides refuge, relief and pleasant contrast to the region most of us come from), the rooms have tropical and art deco looks. The Master and second bedrooms are on the third floor and each has a bathroom with a shower. Both bedrooms have queen beds. The Master bedroom has a walk in closet. The whole Duplex has Direct TV and AT&T for internet. The living room, dining room, kitchen and half bathroom are on the second floor. There is a 55" TV also with Direct TV and a VCR/DVD player, a leather sofa and a leather love seat in the living room. The dining table provides seating for four to six and an additional four bar stools line the adjacent kitchen extended counter. Both living and dining rooms have an open feeling with ocean views. The first floor is a car port area which can also double as a sitting area. Also on the first floor, you'll find a large sink and counter, the utility room which has a washer and dryer and a swing hanging from the balcony facing our yard. There is also an open hot and cold running shower(which is great for a quick rinse after coming back from the Beach). We have tried to keep our rates competative to keep it affordable and maybe help one more dream vacation come true. We hope you will visit Nekolnys Island Oasis, and have a wonderful, enjoyable vacation with lots of memories to take back with you and maybe even cause you to journey back again someday. 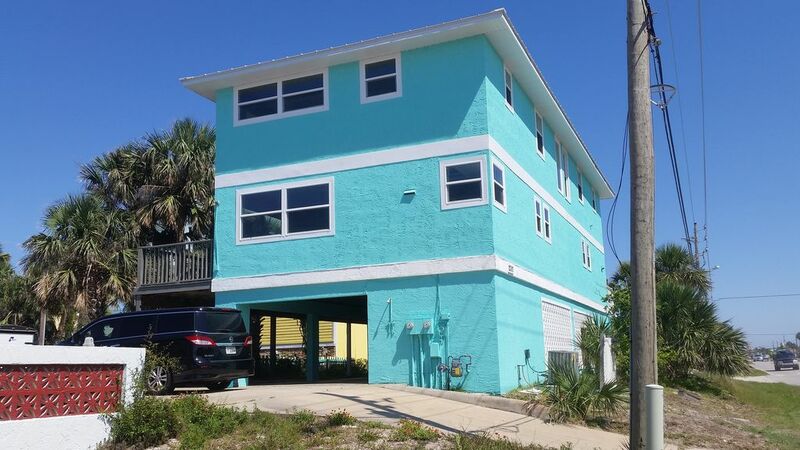 You can see ocean from the East side of the Duplex, its only 200 steps to walk to the Beach and located on East side of A1A(No busy roads to cross to get to Beach either. Clean, spacious, beach access close by and great air conditioning made for a great Labor Day weekend. The house is well appointed and comfy enough to relax in. We will be back. We had a great time. Everything we needed was here. Short walk to the beach. Close to amenities. The owner was very responsive and helpful. This is a great place near the beach! Very comfortable and cutely decorated. The house was clean, quiet, well equipped, near but not too near shops, and practically on the beach!